You Window Shoppe renewed my love affair with my house. I literally am in love with my house again…I contacted about 6 companies that I had found. 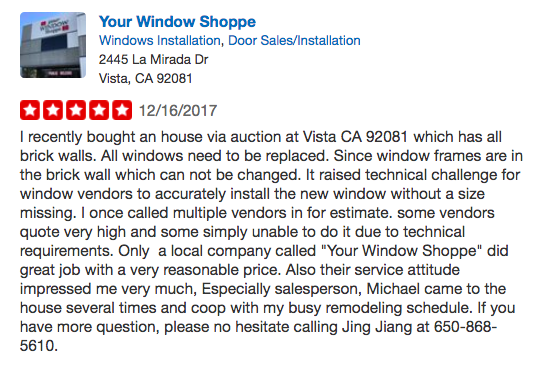 Every single company quoted us between $2500 and $8000 MORE than Your Window Shoppe did. Say what?!?! You read that right. I’ll rephrase. Your Window Shoppe was thousands more affordable. 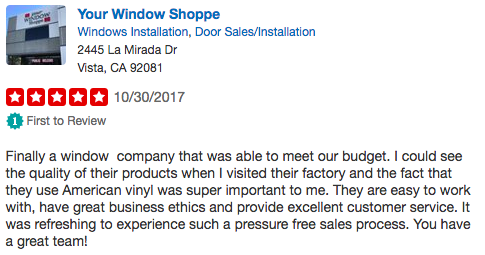 Very happy with the service and product from Your Window Shoppe. Price was fair, they make their own product which is high quality and arrived for installation at the agreed upon time. There was a small issue at the end of the install that they dealt with without question. The owners are friendly and walk you through the entire process. I would not hesitate to recommend this company. I am a real estate broker and have dealt with many subcontractors over the years. I have to say Your Window Shoppe was amazing to say the least! Not only did they do exactly what they said they would do, they did it with a big smile over the phone and in person. I wish I could give them 10 stars!! They were almost half the price of Home Depot! THE MOST PROFESSIONAL PEOPLE I EVER DEALT WITH AND NICE ON TOP OF EVERYTHING ELSE. The windows are great, they left everything perfect, did not disturb my tenants, and the price was right. Margie is great…what else can I say. It was a pleasure to work with you all. Never mind competition….you have NONE. They showed up on time and worked non-stop until the job was done. Except for the beautiful new windows you wouldn’t have known they were here. They left my house looking better than when they started. I will definitely recommend them to my friends and neighbors.